Happy Friday and welcome back to My Mountain. I’ve always been of awe of single parents but Ella’s post last week really captured how it can feel, thanks so much for everyone’s lovely comments. This week’s parenting struggle is from Kamsin and I can definitely relate. When I first came to Japan in 2001, with the intention of staying for a year, I had no idea that one day I would be giving birth and raising a son here. And yet, that it what I find myself doing. I left England to teach EFL in China in 1999 and since then I have spent more time outside of my home country than in it. I have taught in Japan, Indonesia, Bosnia, and Canterbury (the most exotic location, obviously;-p) In 2008 I came to Japan for a second time. A dream teaching job brought me here, but I started seeing a Japanese man who I’d met in the UK. He had just moved back to Tokyo and became my guide to, well everything really. In March 2011, just after the earthquake and tsunami rocked northern Japan we got married. Three years later we had a son. Being a new parent is not short on challenges. Doing it in a foreign country, far from my family adds a whole new layer to those challenges. And finding English speaking mum friends has been a big struggle for me. But more than language and culture, which will probably always be a struggle, it is parenting itself which is the biggest challenge for me. I loved most of my son’s first year. Yes, there were more sleepless nights than not and the struggle to get anything done was real. He was demanding and wanted to be with me all the time. But, he was also pure delight. The biggest smile. The sweetest boy. And he is still those things but…At around a week after his first birthday he started walking. His technique was to pull himself up to standing using the furniture, stick his arms out to catch him should he fall, then put one foot in front of the other as fast as possible until he fell down. He’d only manage two or three steps at first, but it proved a successful strategy. Then almost as soon as he could walk he got to work on running, and jumping and climbing stairs and anything else available to climb. He is constantly covered in bumps and bruises and I am exhausted. Along with the ability to go where he wants, when he wants, at the speed he wants, his sense of curiosity and adventure know no bounds. Did I mention I am exhausted? He does sleep eventually, but not until after countless hugs, water, more water, songs, saying bye bye to the “mon-ter” and endless wriggling around. And trust me I do not need a better routine or more consistent limits. I’m all over that stuff, I’m pretty sure he would walk all over me if I weren’t. His strong personality and boundless energy leave me exhausted. But it has also forced me to find techniques to keep him safe, and prevent constant battles over everything. While he was still a baby the focus was on practical details, I just had to make sure his needs for food, comfort and love were met. Now he’s a little person I actually have to learn how to parent. I learnt very quickly that I needed to set boundaries and stick to them. Any little deviation and he’s taking full advantage to try and get his way. I let him think he’s winning sometimes too, because I’m not actually a dictator;-P A few extra raisins every now and then won’t hurt. But my survival requires strategies to try to prevent tantrums and techniques to deal with them when they do occur. And sleep, if only we could all have more sleep. And it turns out this stuff can be quite hard. Which boundaries, and the best parenting techniques are not obvious. Well, it’s obvious when it’s a matter of safety. But when it’s more about day to day routine then there are choices to be made. I’m used to being flexible and adapting to each situation, I don’t do well with routines. But a child, especially a strong willed one, needs stability, and predictable rhythms in their day. Finding that balance has been a struggle. Now he’s approaching two and adding words and sentences to his vocabulary every day, it’s starting to be fun again. He says funny little things and it’s exciting to watch him learn not just one but two languages. Although two is traditionally the time of terribleness, to me it feels like being able to communicate is making things easier. Perhaps my skills as an English language teacher are helping me here. I’m really good at guessing what people who only know a few words are trying to say. The fact that he understands what I am saying is a breath of fresh air! A few months ago he’d have cried and whined during the 10 minute train ride to our nearest city, for example. Now I can tell him: “Yes, I know you want a snack but we’ll get off soon and then have lunch. OK?” And he watches out the window, or we sing a song or two. When we reach our stop he excitedly yells: “Off! Off!! Alright! Alright!” Which is a big improvement on crying no matter what I did (snacks helped). I think everyone struggles at a different point in early motherhood. Some people find a newborn overwhelming. For me it was having an active walker, who hadn’t yet learnt any sense of danger and with whom I couldn’t communicate effectively. Although I feel things have settled for now, no doubt new challenges will come along again soon. But we all get through it. And that old saying “what doesn’t kill you makes you stronger” is definitely apt. Two may indeed turn out to be terrible, but now it’s just weeks away, I’m no longer dreading it. The last year was a battle. But I’ve got this. Kamsin blogs about motherhood, writing and life in Japan at Life In The Key Of E. Follow her on Twitter or Instagram. Thanks for your comment. No doubt I have a lot to look forward to in the teen years! It sure is relative. Thanks for your comment. It is indeed all relative. Now I just have to face a his constant “no no no” but I can cope with that better than constantly running after him. Eczema is a big struggle. I still suffer as an adult, no fun. And yes, it seems everyone is keen for their little one to walk but once their mobile, there’s no going back! Lol. I have eczema. It must be horrible to see a little one suffer. And yes, it’s hard living so far from home and missing out on family time but being raised in two languages is definitely a big plus for my boy. Thank you! And good luck with your little one. So true than a strong, determined child can achieve so much. I also want to do my best to encourage him not let his strong will be broken….I’m still really tired though. Lol. Yes, it is much easier when they can say what they want. Although today I keep hearing the words “not yet”. “No home yet”, “no bath yet”. But in the long run it is a good thing he has strong opinions. Or something. Lol. Yes! Boundaries and kindness. My hope is that working hard on that now, to maintain his trust will help make things easier as he grows. …I’m pretty strong willed too, I just need to remember not to allow things to become a power struggle and it all goes much smoother. My son is starting to show a real interest in drawing, so here’s hoping we’ll have that to help calm him down. But definitely sports as he grows. We just bought a small jungle gym and it is so great for keeping him busy while I do housework. And yes, I too am learning so much about having an exuberance for life. I reckon my son will be unstoppable as an adult, I may be biased though. No! Don’t tell me that! I’m totally going to pretend it was just get easier from here on in. I refuse to listen to anyone who says it might get harder again. Lol. It’s true what you have said that everyone struggles with the different ages/stages. With my children, they were so different and I struggled with different stages with each child. But walking, no running…yes, that’s been pretty scary. One look away and they can take off so fast. The talking can be quite scary as well as sometimes you don’t know what they’re going to say at the most inappropriate moments. Thanks for linking with #bigpinklink and good luck for the next year! Nice to get to know you a little better. Thanks for your comment. I’m just waiting for my son to be fluent enough to blurt out something totally inappropriate. At the moment he speaks mostly English so many Japanese mums don’t understand anyway! But oh my, I just know he is going to show me up one of these days by something he says. Thanks so much for your comment. The last year has been a real challenge. For lots more reasons than I could write here. But it is always good to hear other people have similar experiences. 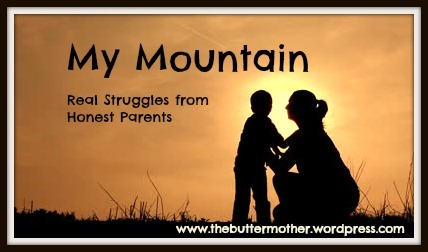 I love how this series of posts has allowed so many moms to share their struggles. I relate with you Kamsin, but they grow up soo fast, so sometimes it encourages me to embrace the moments.